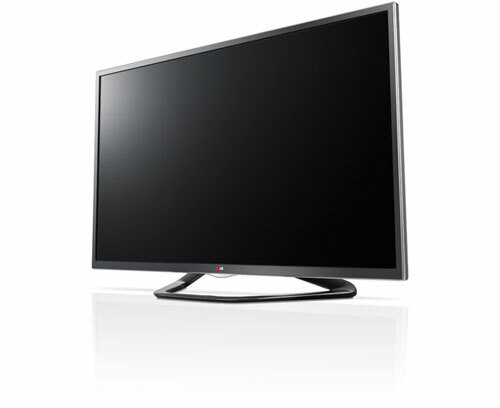 LG’s GA6400 TV lets you enjoy LG’s intuitive user interface with the power of Google. Now you can seamlessly search for content on your TV using Google Chrome and download apps through Google Play with the easy to use LG Magic Remote QWERTY. This TV also boast LED for amazing picture quality and TruMotion 120Hz for smooth and clear images in even the fast action movies or sports*. Talk about the best of both worlds. Imagine the power of Google and the boundless content of the Internet with one of LG’s most innovative TVs. With the simple to use Remote Control you can wave, click, scroll, and type on a QWERTY keyboard to get to what you need faster. Quickly find what’s on with thumbnail previews of every show being aired by your cable provider and see all available on-demand content, TV shows, movies or sports on one device. Plus, organizing your most-used Android apps, getting to your favorite content and surfing the web has never been easier with the intuitive home dashboard. Want to really impress your friends? Just speak your favorite web site into the remote and there it is*. Imagine a remote control, a mouse and a keyboard all rolled into one. That’s a fast-track preview of LG’s impressive Magic Remote QWERTY. Simple gesture control takes your on-screen cursor from the newest movie releases to every friend on Facebook. With a full built-in keyboard, you’ve got all you need to share the excitement. 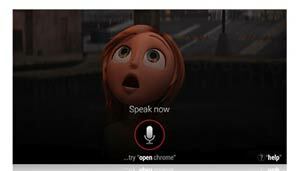 You can even use Voice Search commands. Finding content couldn’t be simpler. Want to find out which 3D movies are on this week? Who’s cooking up Tandoori chicken? What’s your friends’ status on Facebook? The perfect weekend getaway? Couldn’t be simpler thanks to LG’s easy-to-navigate and customizable Home Dashboard. And only LG integrates a convenient Launcher Bar on the bottom of the Dashboard screen, making it easier than ever to connect with your favorite movies, TV shows, social sites and apps. 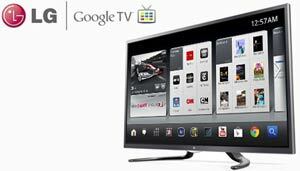 The newest version of Google TV brings the exciting addition of speech commands, and only LG Google TV has it. Simply by speaking into your Magic Remote QWERTY–which contains its own microphone–you can now watch TV shows and movies, open applications, find YouTube videos, visit websites and much more. Searches are quick and incredibly smart, distinguishing between actors, genres, titles, TV channels, apps, etc., so you’re just a few spoken words away from exactly what you want. Want 3D like you get in the movie theater? Lightweight glasses, cool 3D effects and a great picture? 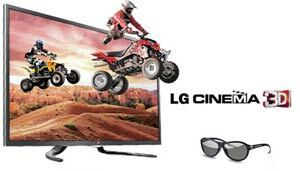 LG’s Cinema 3D TV can bring all this right into your home. Enjoy easy to use & share 3D glasses, outstanding picture quality and amazing 3D effects – that’s what you get with an LG Cinema 3D experience. Disclaimer: For a small percentage of the population, the viewing of stereoscopic 3D video technology may cause discomfort such as headaches, dizziness or nausea. If you experience any symptoms, discontinue using the 3D functionality and contact your health care provider. 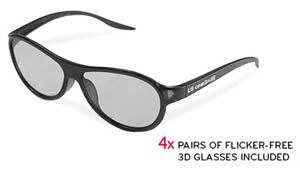 With LG Cinema 3D glasses it’s easier than ever to share immersive 3D images. Battery-free, flicker-free, low cost glasses, just like the ones you get at the movies, allow users to outfit family and friends for an affordable price. 4 sets of glasses included. Gamers can enjoy two-player gaming on one TV without a split screen. Now two players can compete against one another independently and catch the action on a full screen! *Requires special glasses sold separately. Don’t worry about lack of 3D content! 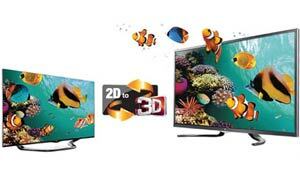 LG’s 2D to 3D conversion automatically convert shows and movies into 3D. Google TV PrimeTime Quick Guide makes it easy to browse live and on-demand TV shows, movies, web video and even DVR content, if compatible with your setup. Peruse offerings from Netflix, Amazon Instant Video, HBO GO, YouTube and other sources in the convenient overlay, which allows you to search while still watching your current program. Then filter the results by time, price and video quality. And when you rate a show or movie, Google TV PrimeTime Quick Guide can begin making personalized recommendations for your future entertainment. 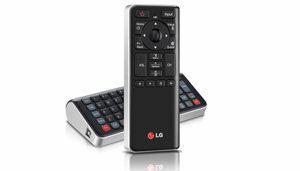 Look forward to smoother navigation through playlists and videos with the latest YouTube app for LG Google TV. A terrific new feature called PrimeTime Quick Guide lets you browse YouTube channels by categories such as news, comedy, celebrities and gossip, gaming and much more. With a touch of a button share the YouTube video you are watching on your portable Android™ device to your LG TV. No need to boot up YouTube on the TV. Kids have candy stores. You’ve got Google Play, the ultimate online emporium for the latest must-have apps, games, movies…and an ever-evolving world of entertainment and information. Discover, buy and share from one convenient location. 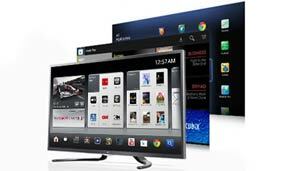 LG Google TV’s L9 Dual Processor delivers the speed you need to do more than you ever imagined. 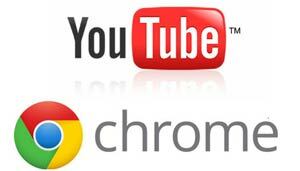 Tap the unbeatable search power of the Google Chrome web browser, post your vacation video on YouTube, plan your sports lineup for the whole season. And wait ’til you experience the fun of watching your favorite shows as you social network at the same time. Multi-tasking to the max has never been so rewarding. LG’s LED technology delivers amazing brightness, clarity and color detail. Tap your NFC enabled device to the NFC tag to create an instant connection to your TV. Now you can share video, photos and music from compatible devices direct to your TV. NFC is an easy way for you or your guests to share content to the big screen*. Access an ever-expanding world of 3D entertainment. With 3D World, you can quickly and easily find 3D movies, documentaries, sporting events, music videos and more – all in stunning 3D for everyone to enjoy together**. Don’t just watch 3D, hear it in 3D. 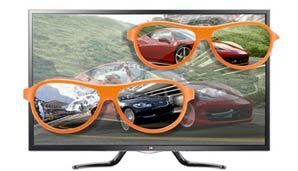 This TV is equipped with 3D Sound Zooming to provide a greater level of sound immersion. Customize your 3D entertainment with 3D Depth Control. With this feature, you have the ability to adjust the 3D effect on your TV to suit your personal taste. Whether it is music, movies, sports or games, Smart Sound Mode automatically adjusts the audio so that you get the full effect of that dramatic moment in a movie or hear the ref’s call in your favorite game. Earning the ENERGY STAR means a product meets strict energy efficiency guidelines set by the US Environmental Protection Agency and the Department of Energy. For TVs, it means they save energy both in standby and active (when they’re on) modes. ENERGY STAR qualified TVs use about 30% less energy than standard units. *Disclaimer: Internet connections & certain subscriptions required and sold separately. Content and services vary by product and are subject to change without notice.